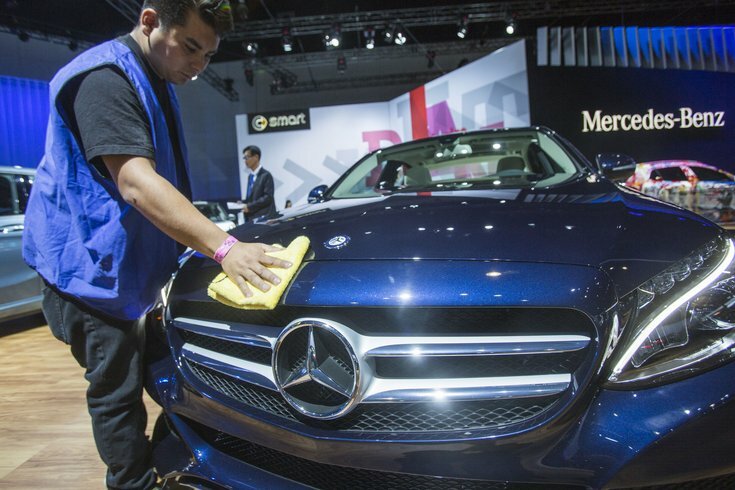 A worker dusts off a new Mercedes-Benz C300 during the media preview day at the 2014 Los Angeles Auto Show in Los Angeles, California. Mercedes-Benz is launching a new subscription service for drivers in Philadelphia and Nashville, Tennessee, allowing customers to drive their luxury cars without owning or leasing one. The car company announced Thursday that the two cities have been chosen for the pilot program, which will begin in June. Drivers who sign up will chose from several monthly subscription tiers, which will give them access to a fleet of Mercedes SUVs, sedans and other models. The Mercedes-Benz Collection experience is equal parts app- and concierge-driven. Once subscribed, customers initiate vehicle exchanges, concierge communication and other actions via the app. Concierge staff then ensure that the delivery is consistent with the details and preferences in the customer's profile. Subscribers will enjoy unlimited access within their tier and no mileage limitations. The monthly subscription fee also includes insurance, 24/7 roadside assistance and vehicle maintenance. It's not specified how much the service will cost. But as The Verge reports, similar services from BMW, Cadillac, and Porsche cost anywhere between $1,800 and $3,000 per month. Digital Trends notes that while Mercedes is keeping local dealers involved in the program by having them maintain and provide vehicles, tension between the subscription service and dealers might heat up if the monthly option becomes popular.